You would never think that you could get up close and personal with colorful, tropical animals while you are in the desert of Las Vegas. 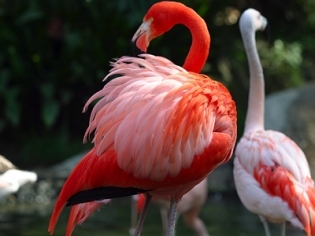 The Flamingo makes it possible by offering a Wildlife Habitat that is completely free! With birds and palm trees above and ponds and waterfalls below, there will be something to amaze everyone inside the Wildlife Habitat. While walking along the one and a half acre guided paths you will see brilliant pink flamingos, large turtles and colorful fish everywhere in a natural setting. Be sure to remember your camera because you won’t want to miss their famous crown crane. You might even catch a glimpse of a parrot! The Wildlife Habitat is also a great, cool place to relax after being out on the hot Las Vegas strip. This is a fun adventure the whole family can enjoy. The atmosphere was very relaxing for us. The palm trees were a nice touch. The birds and fish were so much fun to watch. My husband and I love animals. I suggest checking this one out! I took my kids here on vacation and they just loved it! I loved that it was free too. Definitely cool to check out. I loved seeing this place. The birds and fish were so much fun-especially those chic flamingos. There are nice little tables where you can sit down and enjoy the animals. I loved the gardens they were a beautiful place to sit and drink a morning coffee or beer for that matter. I could have sat there the whole day out in the sun by the fountains and water fall. Only downfall was the smell of the fish when they fed the birds that was not for the weak stomached. Vegas can be busy. Being here walking around and enjoying the birds , palm tree and the beauty of the grounds was an enjoyable relaxing moment. A must for all. When we went there were a lot of bride and grooms taking pictures. I didnt mind because it was very relaxing and I enjoyed watching them. The animals were very cute also.